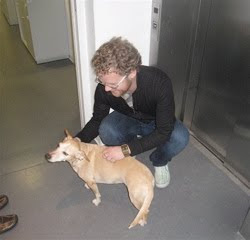 The theater has a dog named Lila, one of whose important jobs is to accompany children on their tours of the theater. She also greets arriving artists. She was quite fascinated with Gregory, but then she barked at one of his warmup vocalises and was removed from our rehearsal. Too bad - we would have been happy for her to stay.